Platinum Pass! 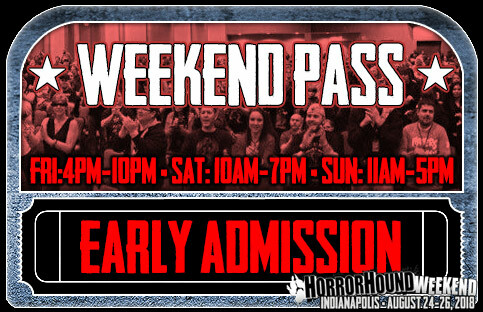 This ticket grants holder admission into HorrorHound Weekend during normal business hours ALL WEEKEND – August 24-26th, 2018 – with one-hour early admission into the event Friday and Saturday! (Early Admission Hours: Friday: 4pm-10pm, Saturday: 10am-7pm, Sunday: 11am-5pm). 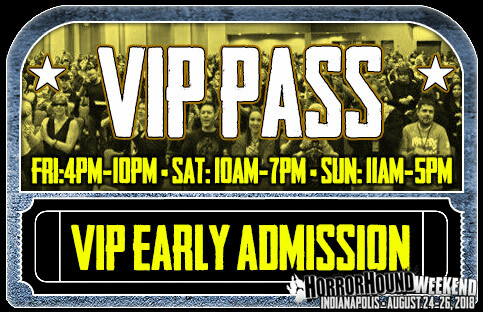 Ticket grants admission into the convention center with access to the vendor, celebrity, Q&A panels, the HorrorHound Film Fest, and all after-hour events. Additionally – for couples or families – this show, we are offering an add on option. By choosing Platinum ticket add-ons, you will receive one hotel room and parking pass, but you can add on up to 3 additional attendees (who will all receive early entry, line cut privileges, merchandise, and perks detailed below). Dedicated Platinum Floor with Breakfast, Snacks, and evening Cocktails. VIP and Platinum-exclusive limited edition enamel pins. Additionally, Platinum Pass Holder will receive a special line-cut pass which will be good for one line cut per EACH line-cut accessible guests (including Robert Englund, Peter Weller, and more TBA). *Between 8-12 different line-cuts total. *Hotel reservation information will be emailed no later than one month prior to event. Hotel will be good for a two-night stay (Friday-Sunday). Additional nights can be added at ticket-holders expense. Reservation name(s) can be changed once final reservation information is emailed to ticket buyer. **For Couples and Families: You can now use a drop-down menu on this ticket type to add on additional Platinum tickets (for your family or partner) at the additional cost of $200 per person. You can add on upwards of three additional Platinum tickets by using this drop down option. By using this drop-down option to add on to your order, you will receive only one hotel room and one parking pass. If you require more than one hotel room or one parking pass, you can either purchase multiple platinum packages (without utilizing the add-on pulldown), or you can make additional hotel reservations by calling the JW Marriott direct. VIP Ticket! 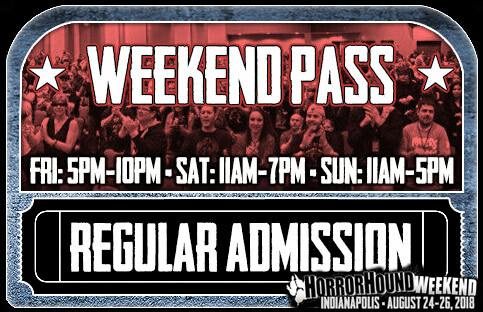 This ticket grants holder admission into HorrorHound Weekend during normal business hours ALL WEEKEND – August 24-26th, 2018 – with one-hour early admission to the event Friday and Saturday! (Early Admission Hours: Friday: 4pm-10pm, Saturday: 10am-7pm, Sunday: 11am-5pm). Ticket grants admission into the convention center with access to the vendor, celebrity, tattoo room, Q&A panels, and the HorrorHound Film Fest. Guaranteed access into Saturday night's after party event. Additionally, VIP will receive a special line-cut pass which will be good for one line cut per selected guests (good for up to three guest line cuts. Line cut guest options include Robert Englund, Peter Weller, and more names TBA). 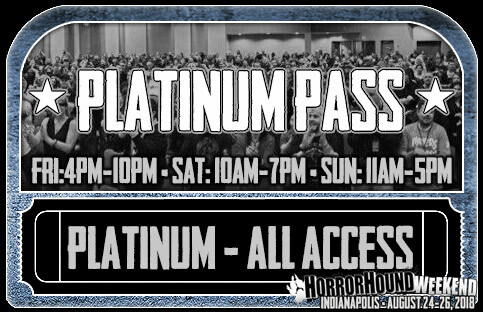 Admission into HorrorHound Weekend during normal business hours ALL WEEKEND – August 24-26th, 2018 – with one-hour early admission to the event Friday and Saturday! (Early Admission Hours: Friday: 4pm-10pm, Saturday: 10am-7pm, Sunday: 11am-5pm). Ticket grants admission into the convention center with access to the vendor, celebrity, tattoo room, Q&A panels, and the HorrorHound Film Fest. Admission into HorrorHound Weekend during normal business hours ALL WEEKEND – August 24-26th, 2018 (Hours: Friday: 5pm-10pm, Saturday: 11am-7pm, Sunday: 11am-5pm). Ticket grants admission into the convention center with access to the vendor, celebrity, tattoo room, Q&A panels, and the HorrorHound Film Fest. 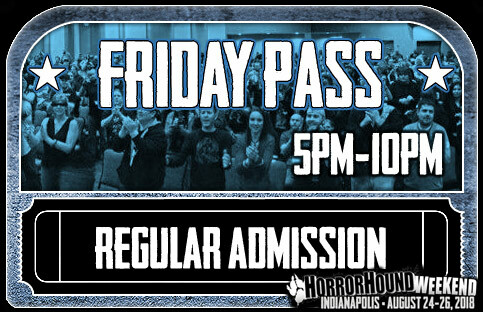 Admission into HorrorHound Weekend during normal business hours on FRIDAY, August 24th, 2018 (Hours: 5pm-10pm). Ticket grants admission into the convention center with access to the vendor, celebrity, tattoo room, Q&A panels, and the HorrorHound Film Fest. Admission into HorrorHound Weekend during normal business hours on SATURDAY, August 25th, 2018 (Hours: 11am-7pm). Ticket grants admission into the convention center with access to the vendor, celebrity, tattoo room, Q&A panels, and the HorrorHound Film Fest. 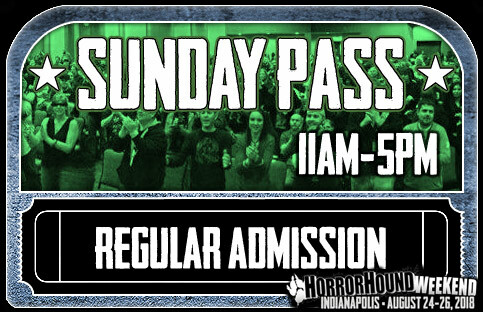 Admission into HorrorHound Weekend during normal business hours on SUNDAY, August 26th, 2018 (Hours: 11am-5pm). Ticket grants admission into the convention center with access to the vendor, celebrity, tattoo room, Q&A panels, and the HorrorHound Film Fest.